Today was more fun than I expected. We are docked at Laem Chabang, Thailand both today and tomorrow. When we looked at the tours available, we were a little disappointed because all but one tour was either listed as strenuous or involved a 8-10 day. Most of the tours involve a 2 hour bus ride each way to get to Bangkok from here. Spending 4 hours on a bus is not our idea of fun. I really like elephants, so even though yesterday's tour included an elephant show, we booked the tour to the "Pattaya Elephant Village" since it was only a 45 minute drive. When we arrived, we found out a little about the history of the place. Asian elephants used to be used to drag logs out of the forest. 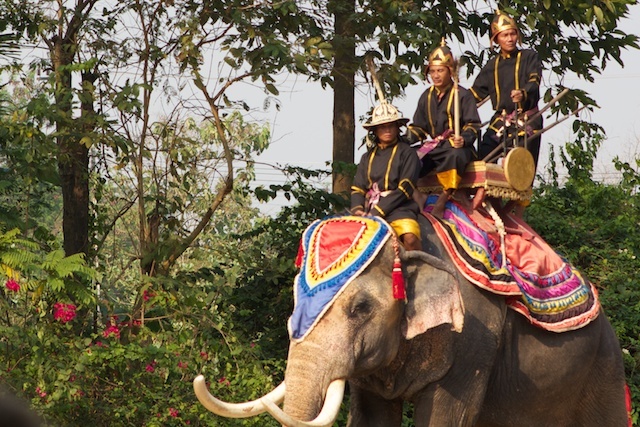 Pattaya originally was the location of an elephant hospital to care for injured animals. 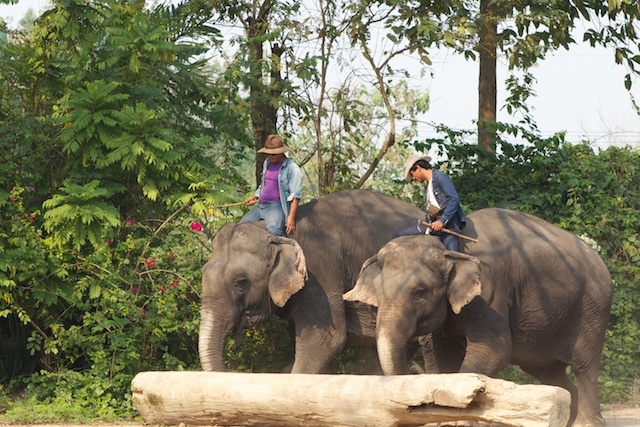 When the government outlawed logging, the elephants were out of work and their owners brought them into the city to try to make money giving tourist rides. The city is obviously no place for an elephant. The owner of the hospital bought some land outside the city and established Pattaya Elephant Village as a retirement home for elephants. Here they have room to walk around in an open environment and use the skills they learned to earn their keep entertaining the tourists. As we entered the park, we were given a chance to purchase bunches of bananas to feed to the elephants. A number of people did this and it was fun to watch. The elephants really seem to love bananas and eat them whole, skin and all. All but 2 of the elephants at the park are female. We were told that the males are more difficult to handle, especially when in heat. They can only be worked with 6 months out of the year. 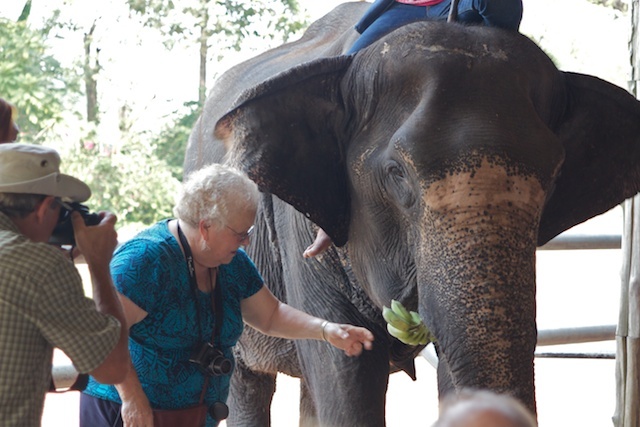 Visitors were then told that we would have 3 opportunities to actually ride the elephants. 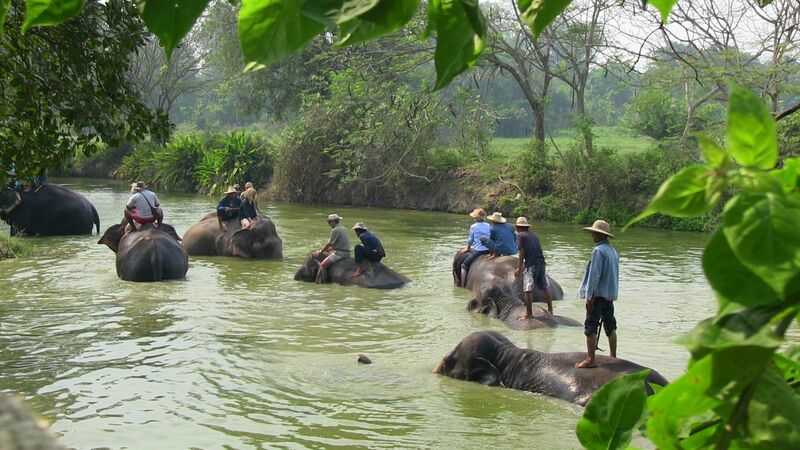 For the first chance, 6 volunteers were offered the chance to "bathe" with the elephants. Volunteers were told to remove their shoes and mount the elephants from a platform. The elephants then proceeded to walk into the nearby stream and bathe. It was fun to watch. The next part was the highlight for me. Since I was a little girl, I have loved elephants. I don't know whether it was seing Dumbo when I was little and having the book read to me, or going to the circus, but I always loved these gentle giants. When I was a little girl and people asked me my name, I would answer Lois Ann Elephant. 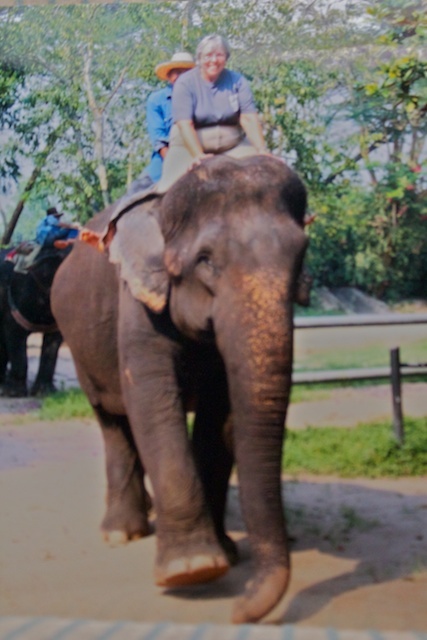 But now, I had a chance to not only get up close to one, but to ride an elephant, and I did. It was very easy to mount the elephant from the platform and just as easy to get off. The problem was keeping my balance as she walked around. It probably takes a little practice, so of like learning to lean the right way on turns on a motorcycle. I did really enjoy riding on one of these beautiful, gentle creatures. This may be the highlight of this trip. Next they showed how the elephants helped in the logging industry, by either pulling or pushing the logs. They also demonstrated how the elephant can lit down to go to sleep. Later, they brought out an elephant who had been trained by a circus. She did some special tricks, like sitting. At the end of the show, one elephant came out dressed as it would have in war, with 3 soldier/riders. At least that's what the announcer said. The soldier uniforms looked plausible, but I thought the elephant was dressed in brighter colors than I would have expected for war. But then, I really don't know Thailand history. When I studied history in school, it was always European history. There is a rich history in Asia that I never learned in school. I hope I am making up for some of that now. There is so much to learn. We got back to the ship about 4:30PM. This gave us plenty of time for a shower and change of clothes for diner. Today is Valentines Day. We had a reservation at one of the specialty restaurants on-board - Signatures. This is a French style restaurant, more formal service than the others. The food was excellent and the mater d gave me a long stem red rose when we entered. It was a great day and a lovely evening.